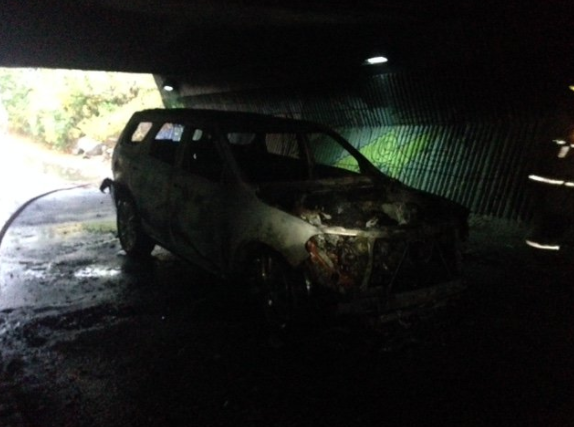 A suspect allegedly driving a stolen vehicle which sped toward officers at police headquarters is on the loose after the SUV he was in was found torched in Meadowvale Saturday. The incident began Friday around 9:30 p.m. in the parking lot of Brampton’s 22 Division on Hurontario St.
“Officers that were here were investigating a white Durango parked in the lot,” said Const. Rachel Gibbs. An officer fired one shot and it entered the rear driver’s side window but didn’t strike the driver, said Gibbs. The Dodge Durango fled the parking lot, with officers in pursuit. The SUV went southbound on Hurontario, then westbound onto Hwy. 407. A pursuit “continued for several minutes and was then discontinued by police,” said Gibbs. Officers linked the SUV to a number of “pump-and-runs” – also known as gas-and-dash thefts – in the GTA, Gibbs said, adding the Durango had been stolen from a rental company at Pearson International Airport. At 7 a.m. Saturday, police received word of a vehicle on fire under an overpass in north Mississauga at Meadowvale Town Centre Circle and Glen Erin Dr. The SUV “was confirmed to be the same vehicle,” said Gibbs, noting there was a pump-and-run reported in Meadowvale prior to the Durango being located. A forensics team is examining the vehicle, while video footage is also being reviewed. The man is described as black, light-skinned, wearing a blue vest. Anyone with information is asked to phone 22 Division’s criminal investigation bureau at (905) 453-2121 ext. 2233 or Crime Stoppers 1-800-222-8477.